My Place: Anything Is Possible. I have been working on a series of paintings based on the antics of my cat Ambrose aka Bro. The first painting (below) I did ages ago. Bro like all male cats likes to wander, and I imagined that perhaps he was doing the big OE. (Overseas experience that is a rite of passage for many young kiwis and Aussies.) Last week it rained a lot and the garden was under water. One day I looked out the window and there was Bro with the cat from a couple of houses away (they pretend they don’t like each other!). They were sitting in about 3 inches of water patting at the drowning plants! It was so funny. We are lead to believe that cats don't like water, er umm somebody didn’t tell these two! As labels, set patterns of behaviour are limiting. If cats want to surf, why not. So, here is Prince Ambrose in Hawaii surfing with a mate! As always on a Friday I am linking the above with Eva and Kirsten at Paint Party Friday. For December’s Mix It Monthly hosted by Conny of PiaRom Art Blog fame my entry is below, the prompt colours are red, green and yellow and the subject owls. I had to enter because I adore owls. So out came my stash of watercolour scraps and in no time I had collage this journal page. Oooh What a funny cats :-)I looove this,and your owl its amaizing,very,very beautiful and adorable,love the colors too. haha, that's the first thing I thought of, that cats don't like water :-) He looks like quite character! Love your colourful owl! I ADORE the kitty's they are so colorful and you have captured the 'antics' perfectly. Thanks for sharing. Happy PPF. Your little owl is adorable but I really love those cats! I have 3 cats who own me so I really enjoyed the cats. 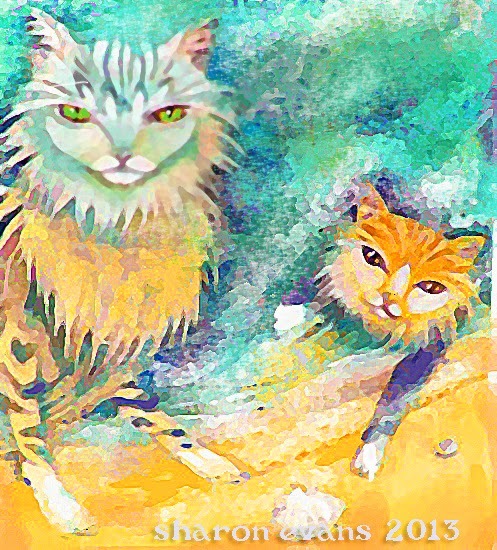 Your cat paintings have so much character! Cool pics and funny cat post! Your cat pictures are very beautiful, Sharon! I love the style of the first piece! I adore your cats, Ambrose sounds such a character! I love the description of the way the two cats pretend not to like eachother. Anyone with a cat will recognise this' I'm not at all bothered' behaviour. 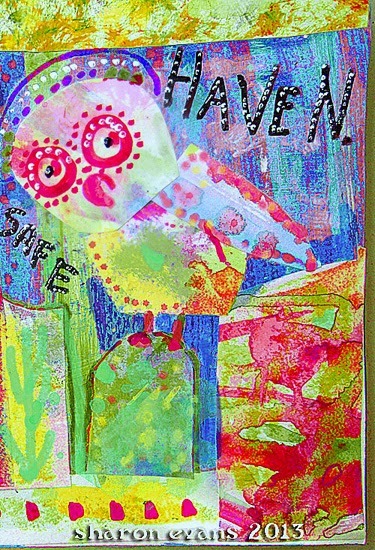 The final "mix it" owl is great, it is such a lovely theme and you have used the colour combination so well! really love the cats so whimsical. Hi Sharon..wow..your cats are exquisite..they have stolen my heart! The first one is stunning..and so impressionistic and expressive in energy and color..I love how each brushstroke feels like light ..so luminous and shining...powerful and magical! and the second blue cat..like a magical story about to unfold..this piece really comes to life..I am really captivated by this amazing soul! Strong and Beautiful! I love all that you share...pure awesomeness! I love that your cats have their stories to tell and you are painting them. Great job. Lots of fun! Beautiful work as always!! I am seeing a kids book in the mix with all of Bros antics!! I think kids would love it...especially cat lovers!! how fun to learn about your water loving kitty and friend. i love seeing both of your pieces, well all three really. Colorful and a joy to see. Such wonderful work Sharon, I love it all, but that last colorful piece is a favorite, wonderful and joyful! Sharon these are fantastic! Such expression. A surfing cat - why not?? They always surprise us, don't they? :) Cats are amazing, and I love yours. What a wonderful idea to paint your cats and their antics! I was just thinking of painting my cats today - doing something silly like building a snowman! Beautiful! Love your pinky-winky owl, Sharon !great background as well! Awesome cats and love your owl too! So cheerful and colorful! Your colorful paintings are just super, Sharon. I especially love the two cats in the water. Thanks for your caring thoughts from across the waters.